Russia and U.S. reaffirm nuclear security as priority over politics. Despite strained relations, the United States and Russia are continuing to collaborate on a radioactive waste management program that has been in place for the past 15 years. At the opening of the VI ATOMEX 2014 International Forum of Nuclear Industry Suppliers in Moscow on Oct. 29, Sergei Kiriyenko, the general director of Russia’s state nuclear agency Rosatom, said that the sanctions against Russia have had no effect on the Russian nuclear industry and that all contracts with foreign partners are being carried out in full. Russia and the United States signed the 20-year intergovernmental Megatons to Megawatts Agreement – also known as the Highly Enriched Uranium Purchase Agreement – on Feb. 18, 1993. Under this agreement, 500 tons of highly enriched Russian weapons-grade uranium was converted into low-enriched uranium and later used as fuel for U.S. nuclear power plants. The program was successfully completed in January 2013. “The Russian nuclear industry is not a target of the sanctions. That goes for both individuals and corporations,” Kiriyenko said. He had previously noted that Rosatom has long-term, mutually beneficial relations with American nuclear players that are much stronger than any political disagreements. According to Kiriyenko, integration has reached such a high level that Rosatom currently owns 20 percent of U.S. uranium reserves. “We have been implementing the Megatons to Megawatts Program for the last 20 years, in which Russian fuel has met half the needs of U.S. nuclear power plants. 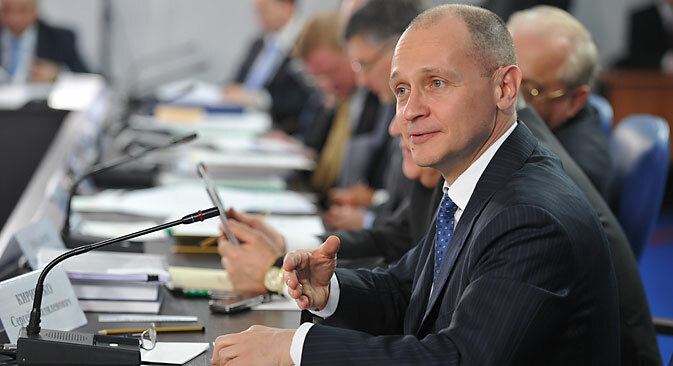 We’ve had better and worse times during that time, but we have not seen a single disruption in fuel supplies – not a single day’s delay – in 20 years,” Kiriyenko said. The United States has no intention of abandoning its collaboration with Russia to ensure nuclear security or cooperation in nuclear energy and research, U.S. Secretary of Energy Ernest Moniz said at the 58th International Atomic Energy Agency (IAEA) General Conference in Vienna at the end of September. According to Moniz, everyone understands that serious tensions have arisen between Russia and the United States. However, the two countries are continuing to work together on individual projects, according to Moniz, including a program focused on the highly enriched fuel intended for research reactors. The program exists from 1999, through it specialists from the United States and Russiaare working to return spent nuclear fuel from research reactors to its country of origin so it does not spread illegally and end up in the hands of terrorists. Director of informational and analytical portal Nuclear.Ru Ilya Platonov said that the U.S. Secretary of Energy’s statement was meant to entrench the status quo. “The nuclear security issue is traditionally of extreme importance to the Americans, and in light of the growing tension in relations between the countries, it is highly important to note a consistent position. The program to export highly enriched fuel from research reactors is symbolic in that its end goal is to convert all reactors to low-enriched fuel,” Platonov said. He added that this is one of the key conditions of nuclear non-proliferation, because the higher the degree of enrichment, the closer the uranium is to being weapons-grade. So far, more than 3,500 lbs. of spent and fresh highly enriched fuel have been removed. Russia and the United States plan to continue the program at least until 2016. The U.S. finances the entire program; Russia’s contribution is its unique experience and high technology.